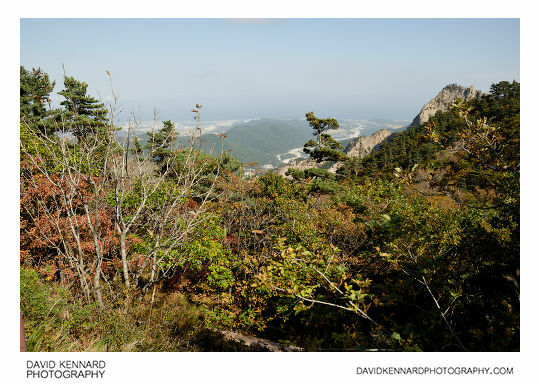 Once we reached the cable car station at the "top" of the mountain, it was then a walk up towards Gwongeumseong. The path along the route is well laid out with a sort of rubber matting, making the walk easy for those not suited to mountain climbing. Along the way you could look back and get some great views of the surrounding mountains. You might just be able to make out in the above photo the first signs of autumn. Soraksan must look amazing in full autumn colours. 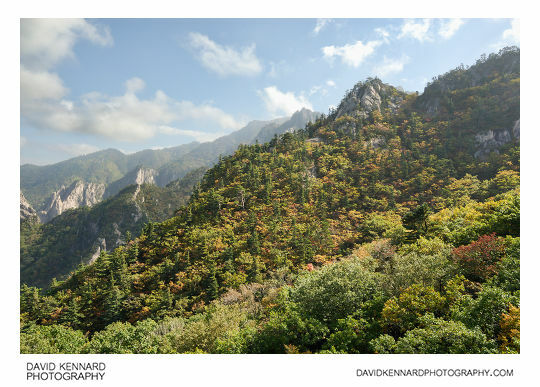 You can see in the photo above there are a variety of different trees and bushes that grow on the mountain. 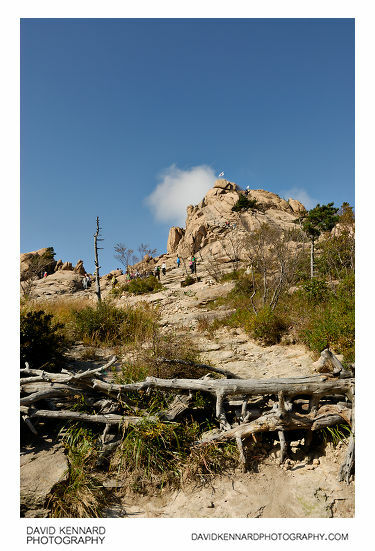 After walking along the path we come to Gwongeumseong (Hangeul: 권금성; Hanja: 權金城). The area is so named because according to legend, two strong men, Mr Gwon (權) and Mr Kim (金), built a castle (城) here overnight to fight off enemies when a war broke out. 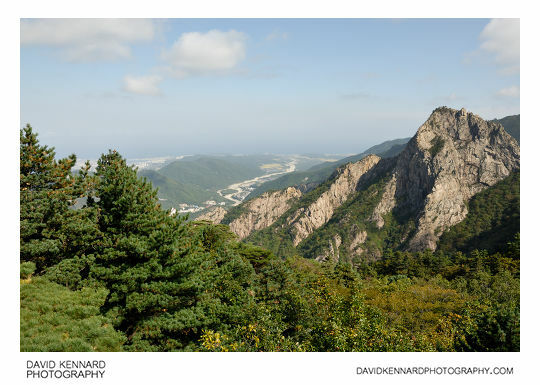 You might wonder why the area is called Gwongeumseong instead of Gwonkimseong. I'm not sure exactly, possibly it is to do with the phoentics of the Korean language, but 金 is the character for the surname Kim as well as meaning gold (geum). So it does mean Gwon and Kim's castle even if it doesn't sound like it. Above is a tourist shot of my brother, and yes, I purposefully included the other tourists. 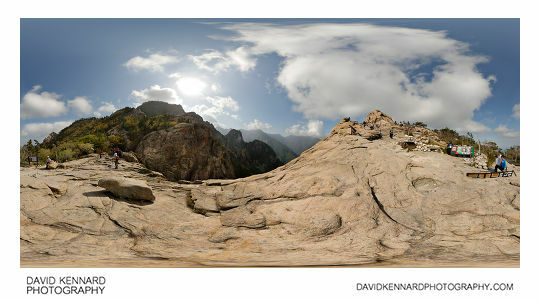 The photo above is a 360° pano I took at Gwongeumseong. 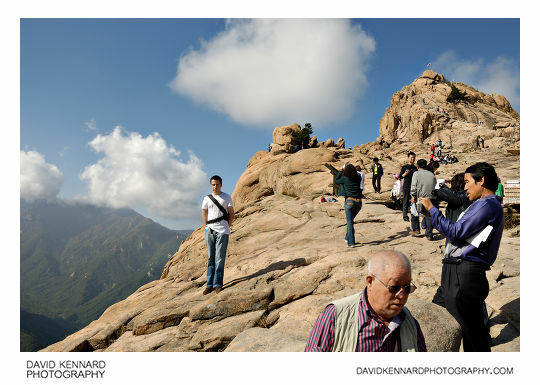 I read on the Sorak Cable Car website that the large rock nearby on the plateau is called 'Seal rock'. It does kind of look a bit a seal I guess. I couldn't corroborate this name anywhere else though, so I don't think that the rock actually has an official name.